As you're munching on your blueberry scone and sipping your warm latte this morning, there is a series of train-like structures crawling on a floating ice shelf 900 miles from the South Pole. The Halley VI Research Station officially opened yesterday with 25 years of research leading up to this moment. 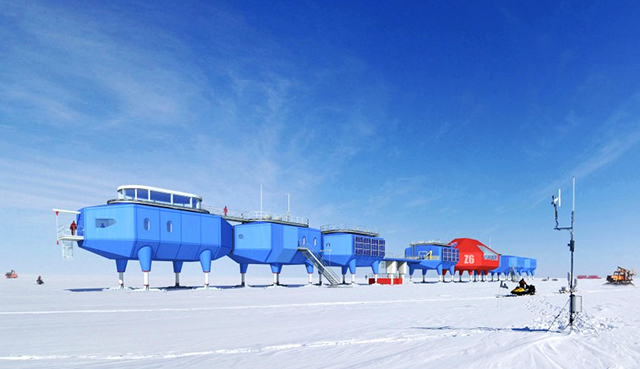 Previous attempts to build antarctic research stations have resulted in them becoming snowed in, therefore immobile. Halley V continues to operate effectively, but a significant calving of the ice shelf is predicted within the next decade, which would see it floating out to sea as a giant iceberg! This prediction led to an international design competition in 2004 for of a new, fully relocatable base for 16 people in the winter and 52 in the summer. 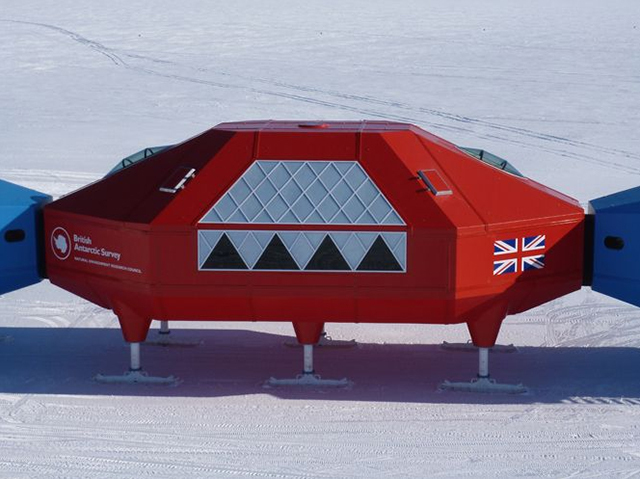 The British Antarctic Survey selected Hugh Broughton Architects, and engineering giants AECOM, as the winners. The structures are hydraulically elevated ski based modules that respond to annually rising snow levels and determines when and if there is a need to relocate the base if the site calves off as an iceberg.Here, the snow levels rise by over 3 feet each year and the sun does not rise above the horizon for 105 days during winter - the magical stars provide earthly entertainment for the team of engineers, researchers, and architects. The nature of the project is unusual and extreme. It's clear that Karl Tuplin, Halley VI's Project Manager, has a big passion for the chilly Antarctic. Tuplin's entire life has been taken over by the project as leads the structures on site and has blogged about Halley VI's struggles, concerns, and triumphs for the curious minds. Along with Tuplin, Architect Hugh Broughton made frequent trips to the site also keeping a detailed diary. Temperatures drop to -56C and the site can be buffeted by winds in excess of 100 mph, because of the harsh weather conditions, access by ship and plane is limited to a 3-months window. Materials and components required to construct the new base have to be delivered across fragile sea ice, which can fracture at any time. The design of the structures have been developed in response to the demands of the science, the comfort of the residents, build-ability and the operations inherent in the life of a research station. To meet these demands it is crucial to create a design, which maximizes flexibility. This is achieved with a modular approach. Modules can be used for a wide variety of activities ranging from laboratories and bedrooms to recreation areas and energy centers. Connected together, the modules form the new station. Modularity brings significant benefits in terms of flexibility, ease of construction, maintenance, relocation, fire safety, acoustics and robustness. The station is centered on two modular platforms. The northern platform provides the principal habitat. The southern platform contains science modules. The majority of activities that take place at Halley can be provided for using the standard blue module, there are some activities, which are constant, and require a distinct approach. These activities are housed in a special red central module. This is the principal space for eating, drinking and recreation and is the major destination at the new base. The central module provides a dramatic open plan social area at the heart of the station. The project demonstrates the ability to create world-class sustainable design to awesome technical criteria. Halley VI is the most environmentally friendly facility that BAS has built. Low on environmental impact during construction, with an extremely efficient, environmentally aware performance life cycle, it can be easily moved and eventually taken apart when the time comes. 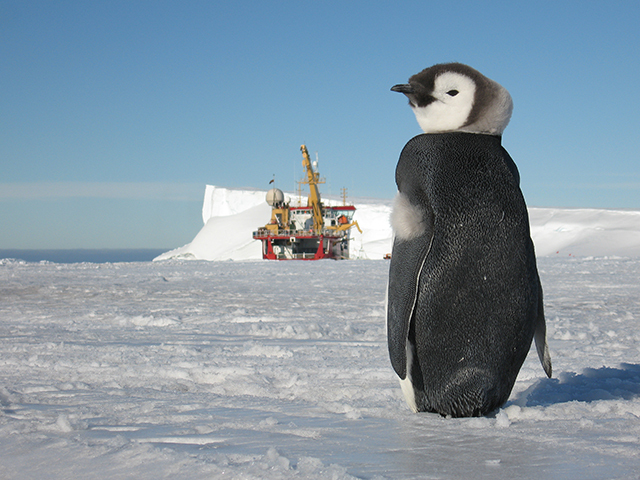 Halley VI will be a visitor to Antarctica, not a resident. The buildings rest entirely on the surface of the ice shelf. This mobility and flexibility means that the new station will survive and perform on the ice for far longer than any of its distinguished predecessors.